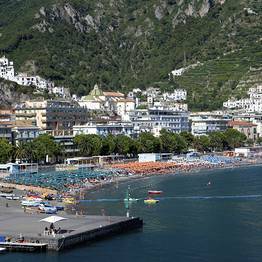 The most family friendly beaches on the Amalfi Coast. 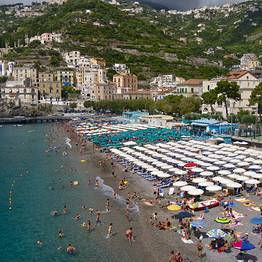 Maiori has the longest beach of all those on the Amalfi Coast: almost a kilometer of sand with a dozen or so bathing establishments and a level waterfront completely different from that of all the other beaches on the Amalfi Coast. The beach's unique conformation was the result of catastrophic flooding and consequent landslide in 1954, which destroyed the whole of the old town and created today's "flat" seafront. 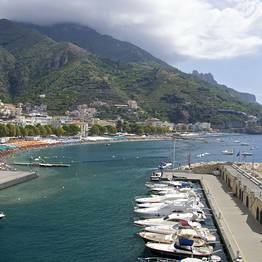 The sandy beach and the quantity of beach front hotels and restaurants make Maiori a favorite holiday destination with families and, in particular, those with small children. 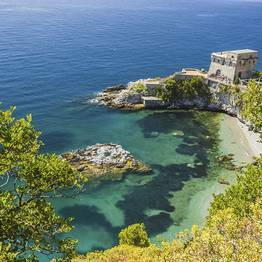 Having been spared the floods of 1954, Minori has conserved all the characteristics of the area's traditional coastal villages; namely, a maze of little lanes and squares, sloping down towards the beach and seafront promenade. 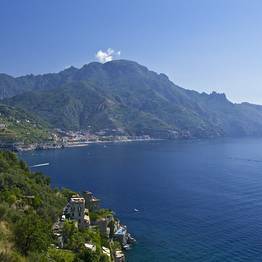 A fraction of Maiori, Erchie is a tiny fishing village overlooking one of the most beautiful beaches on the whole of the Amalfi Coast. The two hundred meter long beach is guarded by two Saracen towers, originally built to warn off pirate attack. The water is always clean and the beach catches the sun until late afternoon. There is a stretch of "free" beach next to the bathing establishments. There are a number of casual eateries close to the beach, serving delicious fish specialties. By car: On the SS163, three kilometers after Cetara (for those driving from Vietri) you'll see the turning for Erchie. You can pay to leave your vehicle in one of the town's car parks, from where a short flight of steps leads down to the beach. By public transport: Salerno - Amalfi bus line. The bus will leave you at the junction on the main road, from here you will need to walk down to the beach. 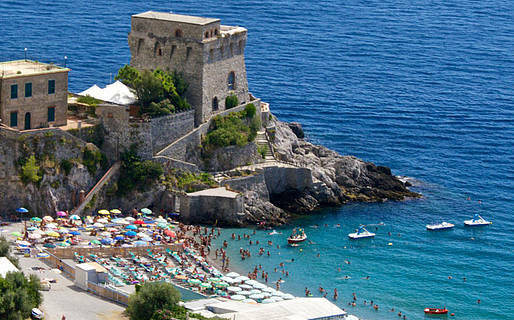 Maiori beach is 930 meters long and 40 meters wide and is one of very few sandy beaches on the Amalfi Coast. The beach is almost completely occupied by bathing establishments. There are just two narrow strips of "free" beach at either end of the beach. Refreshments are available from kiosks located in both the bathing establishments and on free areas. 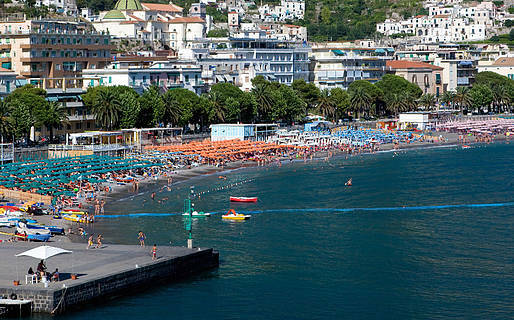 Maiori beach is located directly opposite the town with which it shares its name, on the other side of the main road. By car: Exit the A3 motorway at Vietri sul Mare and head towards Maiori. At the end of the road running parallel to the sea, to the right, you'll find a large car park. Alternatively, there are parking spaces along the roads in the town (charge applies). Minori beach is a 250 meter long, sandy beach. In the middle of the beach there are 3 bathing establishments, to either side of which the beach is 'free'. 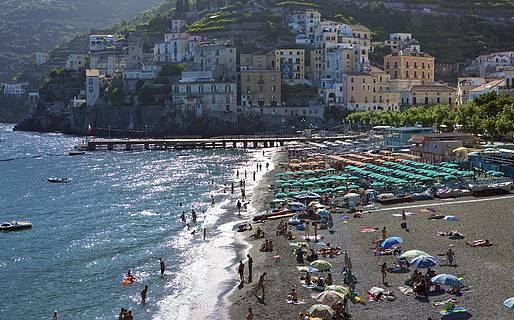 Minori beach faces south and is bathed in sunshine for much of the day. Whilst in Minori, you'll want to pop in to Salvatore De Riso's pastry shop to sample some of the mouth watering delicacies created by the Amalfi Coast's most famous pastry chef! By car: traveling on the SS 163, from Vietri, proceed beyond Maiori and after a couple of bends you'll come to Minori. You can pay to park your vehicle on the blue lines, or in one of the town's three car parks.